A potent liquid extract of this popular plant. 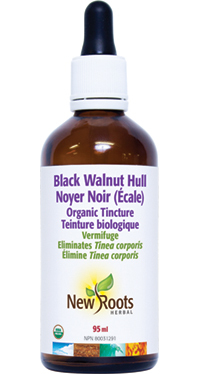 Black walnut has typically been used as an aid to the digestive system and to rid parasites. Rich in chromium and iodine, black walnut is also often used in cases of a weak immune system, glandular problems, and skin disorders. This plant cleanses and purifies the blood. It is very effective in the treatment of intestinal parasites, fighting them and expelling them from the organism. It has a laxative action as part of the detoxication and decongestion action on the organism, affecting the whole system. It is very beneficial in a variety of skin disorders. It has a great amount of minerals, trace elements, and amino acids. It should be used in bone disorders and mineral deficiency. Shake well. Adults: Take 1 teaspoon three times daily or as directed by your health-care practitioner. If you are taking other medications, take this product 2 hours before or after them. For temporary use only. Other ingredients: Certified organic alcohol (25%) and purified water.